Also serving communities of North Chili. There are 29 Assisted Living Facilities in the Rochester area, with 18 in Rochester and 11 nearby. The average cost of assisted living in Rochester is $3,443 per month. This is higher than the national median of $3,346. To help you with your search, browse the 218 reviews below for assisted living facilities in Rochester. On average, consumers rate assisted living in Rochester 4.1 out of 5 stars. Better rated regions include Pittsford with an average rating of 4.5 out of 5 stars. Caring.com has helped 20 families in Rochester find high-quality senior care. To speak with one of our Family Advisors about assisted living options and costs in Rochester, call (855) 863-8283. Located in upstate New York, Rochester is a small city known for being a beautiful place with plenty of activities for seniors, who comprise more than ten percent of the city's total population. To accommodate this, there are 33 assisted living facilities in the Rochester area. It's also important to note the state of New York has a very strict set of rules and regulations that all licensed assisted living facilities must abide by or risk being fined or shut down. Weather in Rochester ranges between winters that have lows below freezing from November through March and more mild summers that top out with highs in the 80s. However, the average snowfall per winter averages a whopping 99 inches annually. Overall, Rochester’s air quality is considered pretty good on an annual basis, as the breeze from Lake Ontario allows the urban pollution to escape the city limits. The cost of living in Rochester is significantly lower than both the state of New York and national averages. Housing is incredibly inexpensive, at less than a third of the national average, while necessities like groceries, transportation and health care are actually slightly above national averages. The crime rate in Rochester is incredibly high for a city of its size — it's more than double the state and national averages. It is only 7 percent safer than most cities in the United States. Monroe County and the city of Rochester provide transportation through ElderSource. As long as residents are 60 years or older, rides will be provided for discounted rates. The Rochester area is home to world-class medical facilities, including Strong Memorial Hospital of the University of Rochester, in the event of medical emergencies or illness. Assisted Living costs in Rochester start around $3,443 per month on average, while the nationwide average cost of assisted living is $4,000 per month, according to the latest figures from Genworth’s Cost of Care Survey. It’s important to note that assisted living rates in Rochester and the surrounding suburbs can vary widely based on factors such as location, the level of care needed, apartment size and the types of amenities offered at each community. 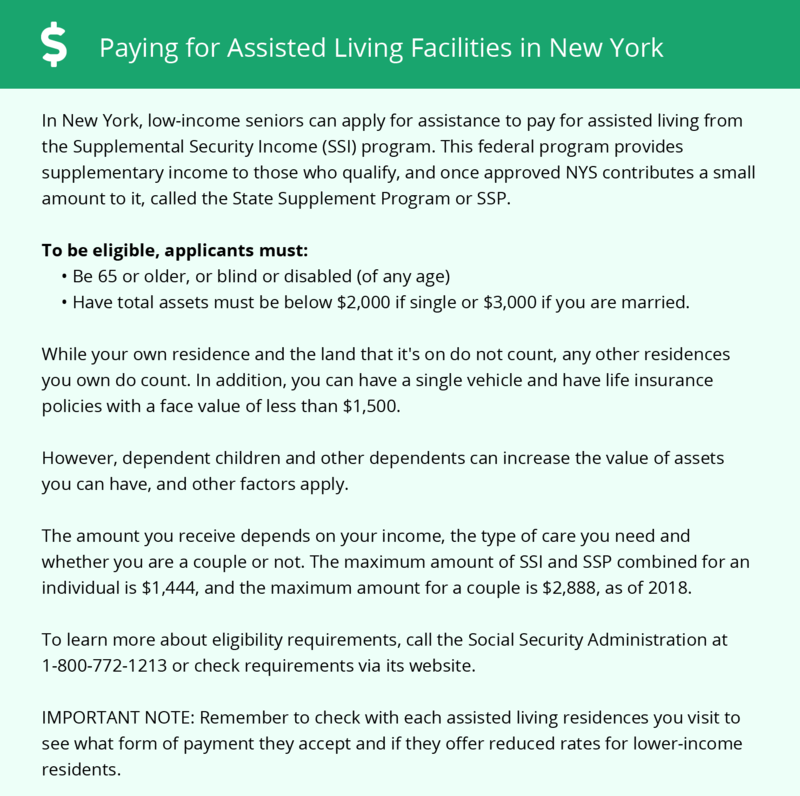 Beyond state Medicaid, the state of New York provides a couple waiver programs that help seniors afford their chosen assisted living facility. The Managed Long Term Care Waiver helps residents with payment in assisted living facilities and the Assisted Living Program helps those who qualify for nursing home care but want to live in an assisted living facility afford it. To see a list of free assisted living resources in Rochester, please visit our Assisted Living in New York page. Rochester-area assisted living communities must adhere to the comprehensive set of state laws and regulations that all assisted living communities in New York are required to follow. Visit our Assisted Living in New York page for more information about these laws.